Marvel's first family made their Marvel UK debut, appropriately enough, in the first M-UK weekly: THE MIGHTY WORLD OF MARVEL (but, of course, Power Comics readers of the late sixties would already know the foursome). 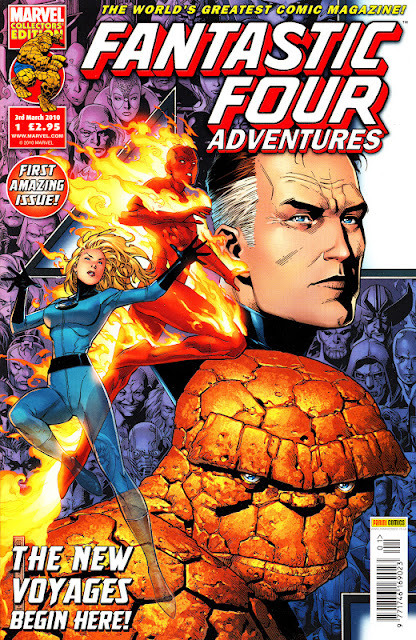 The FF were part of Marvel's big-three line-up. And the second to depart, after Spider-man, leaving the Hulk to hold the fort until 1979. 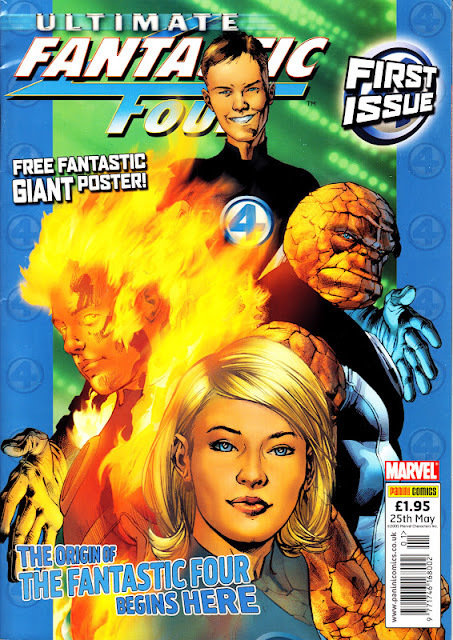 The FF reprints began, predictably enough, with US FANTASTIC FOUR issue 1. The "in full colour" cover splash was a tadge misleading: Captain Britain and Steranko's gorgeous Nick Fury were indeed in colour but the Fantastic Four, relegated to third-feature status, had to settle for the black-and-white bit in the middle. But, they had the last laugh. With sales bottoming out and US reprints of the lead feature sparse, the whole weekly went black and white (with a glossy cover) from issue 24. 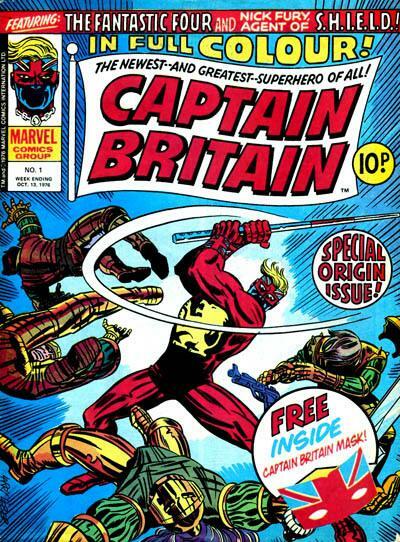 But... that wasn't enough... and Britain's champion merged with SPIDER-MAN from 8 July 1976. The Foursome get some solo action in their own weekly, albeit not for long. 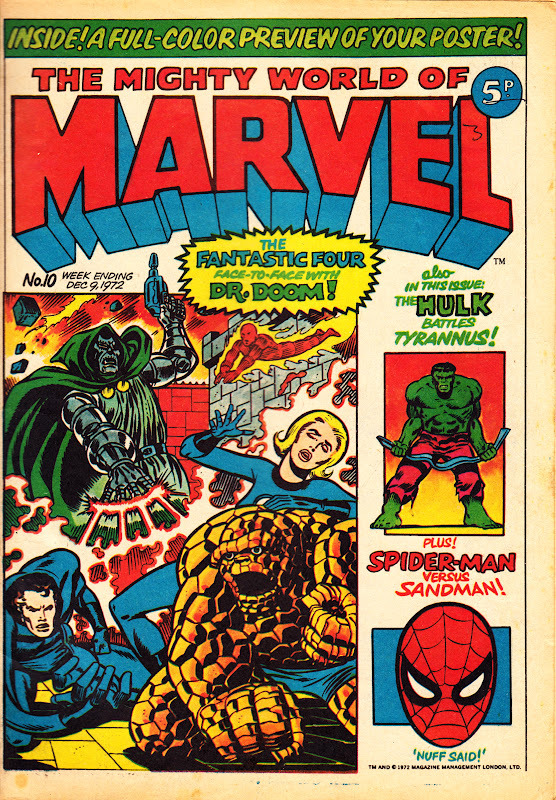 The reprints kicked-off with US FANTASTIC FOUR 133 (April 1973). 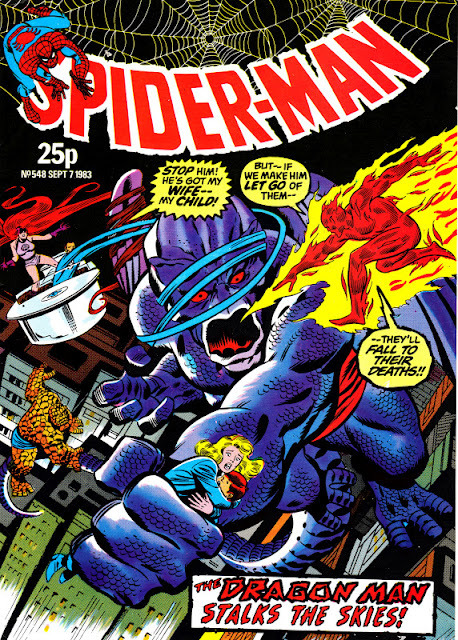 The same run of reprints would appear again in SPIDER-MAN from issue 545 (17 August 1983). 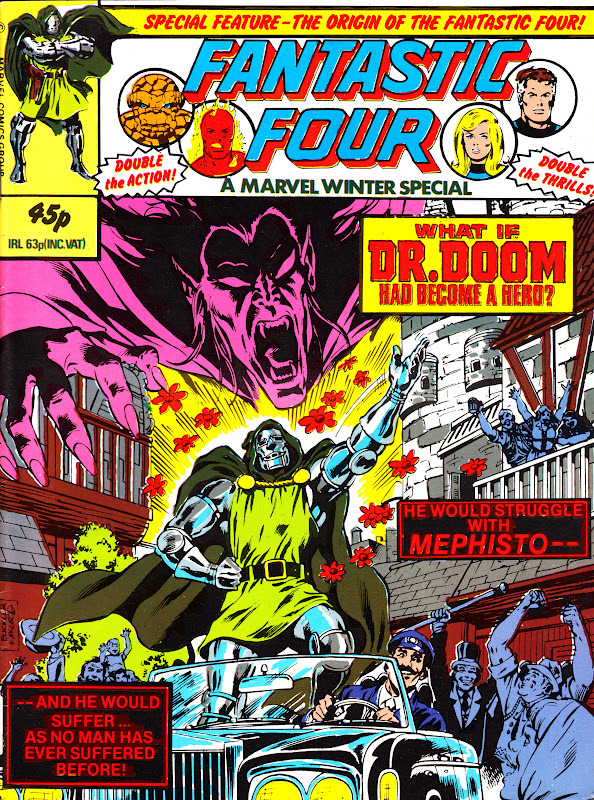 The weekly proved short-lived and the FF were back in THE MIGHTY WORLD OF MARVEL from issue 298. 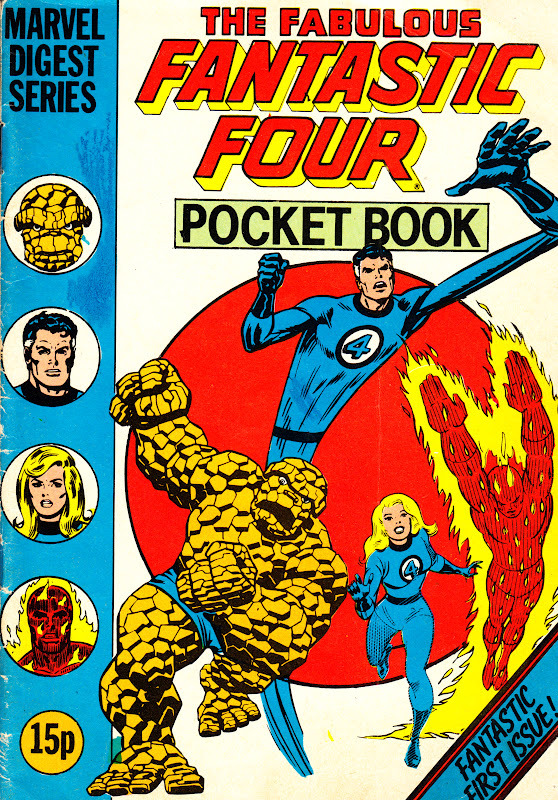 The FF were part of Marvel's first wave of Pocket Books, kicking off a run of reprints from US FANTASTIC FOUR 43. Back to the weeklies, and more contemporary reprints, in this short-lived supporting feature slot. MARVEL TEAM-UP merged with Spider-man (briefly becoming the clumsily titled SPIDER-MAN AND HULK WEEKLY INCORPORATING MARVEL TEAM-UP) from March 1981. 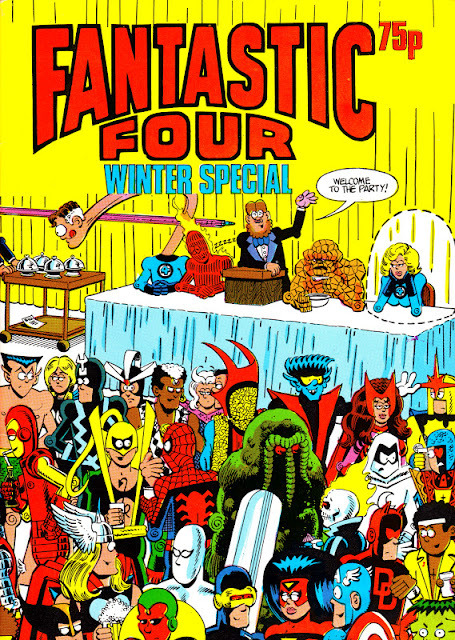 The 1980 FF Winter Special rolled out a reprint of US WHAT IF 22. Just a few weeks after MARVEL TEAM-UP had passed on, the FF were back in Marvel's latest weekly: the even more short-lived MARVEL ACTION. Looking like the kiss-of-death, the FF's new home managed a meagre fifteen weeks on newsagents shelves before merging with CAPTAIN AMERICA, taking the foursome (briefly) with it. 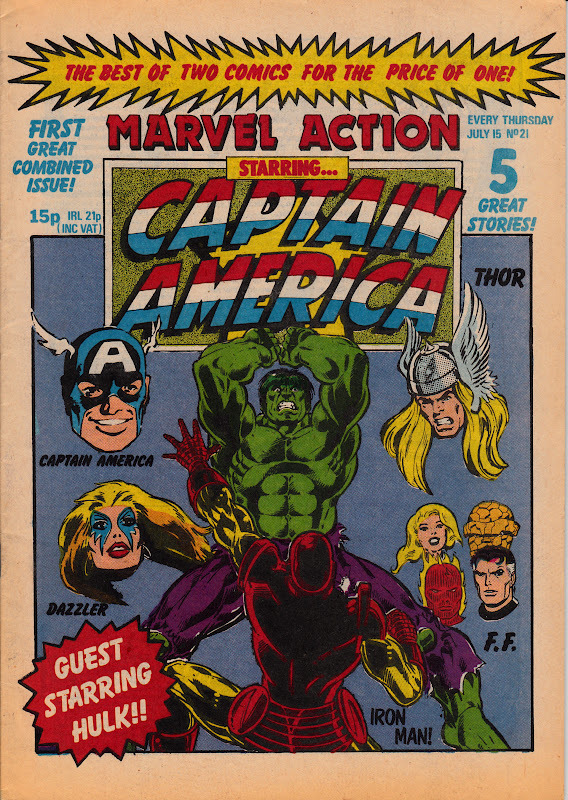 Here they are again, along with Thor, in CAPTAIN AMERICA weekly from issue 21 (15 July 1981). Presumably to test the waters for their next weekly, the FF went solo again in the summer of '82. 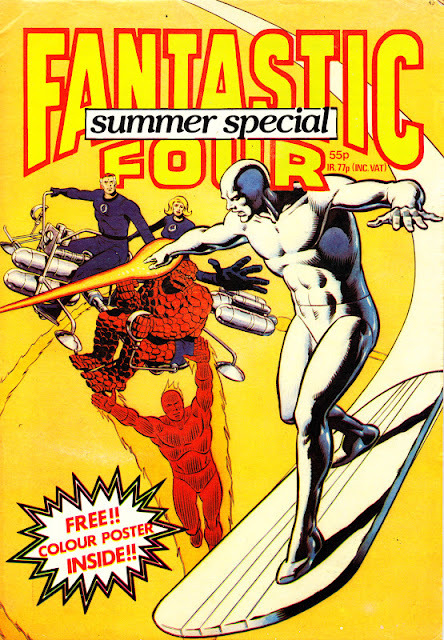 Reaction to the FF's summer excursion must have been good (or Marvel's management were running out of fresh ideas) as they were back in their own weekly that autumn. The reprints rolled back to 1970 and US FANTASTIC FOUR 105. The FF Pocket Book had closed in the summer of '82, the reappearance of a weekly presumably demonstrating that it was one of the more successful. 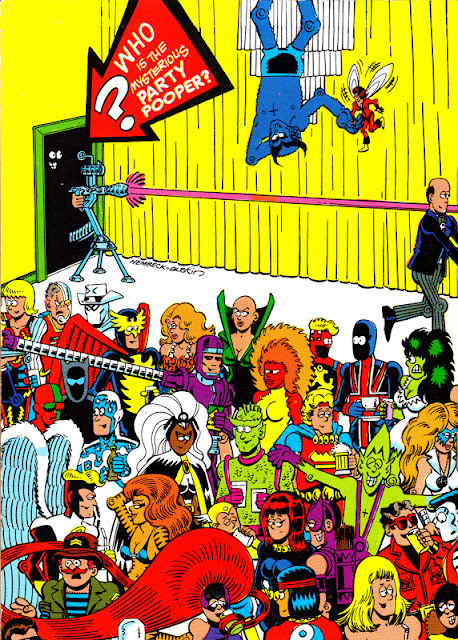 The new weekly was not a rousing success and it closed after a mere 29 issues. Marvel's explanation: they didn't have time to produce it AND their two new colour weeklies THOR and X-MEN. Yup. Nothing at all to do with lousy sales. The FF merged with SPIDER-MAN from issue 529 (27 April 1983), enjoying a reasonable run as supporting feature. A position they should have been familiar with. From issue 545, M-UK began to repeat strips previously published in THE COMPLETE FANTASTIC FOUR, albeit now with some pages in colour. What did casual UK readers make of this full-colour (whoa!) reprint of the humorous Fred Hembeck one-shot FANTASTIC FOUR ROAST? 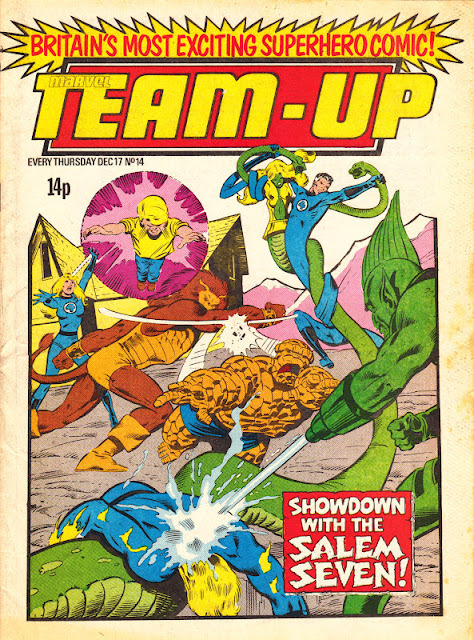 Marvel Two-In-One, starring the Thing, must have made an impression in RAMPAGE monthly as, suddenly (and inexplicably... unless M-UK anticipated a belated UK outing for the decidedly off-message FRED AND BARNEY MEET THE THING animated series), Ben Grimm was granted his own weekly. But... 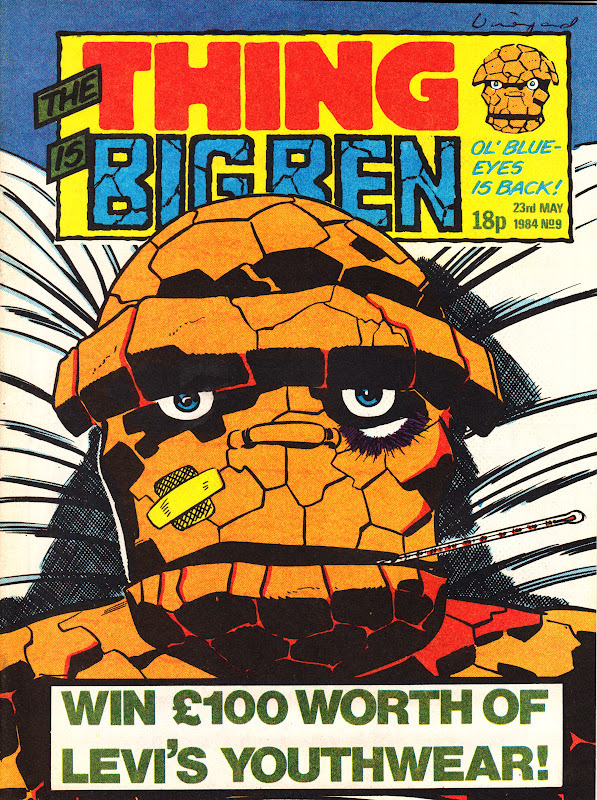 Fame is fleeting (and the animated show never aired in the UK) and, to the surprise of no-one, the hilariously-named THE THING IS BIG BEN suddenly merged with SPIDER-MAN. The FF were announced as the third-feature (IE: the one that didn't get its name in the title) in the revitalised Spider-man weekly, beginning with issue 1. But, apparently, Marvel encountered distributor resistance to featuring two superhero strips and switched the FF for the toy-based Sectaurs (its also possible Marvel were paid to run the strip!). 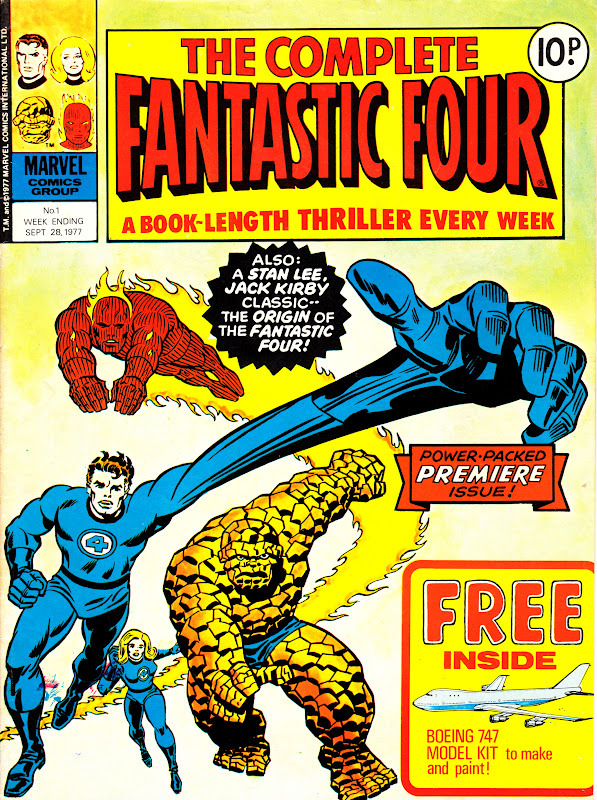 The FF did appear a few weeks later but, in what would become a SM&Z tradition, only stuck around for one story before vacating the back-up slot. A VERY long gap before the FF's next appearance, linked to the belated UK debut of the animated MARVEL ACTION HOUR animated series. 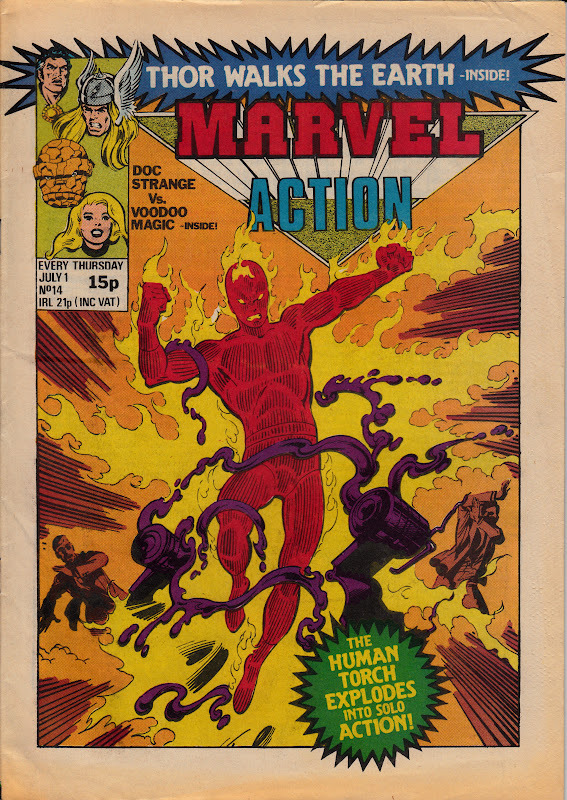 Surprisingly, the fortnightly didn't reprint either the FF or Iron Man strips tied to the TV show published in the States, opting instead for seventies reprints. 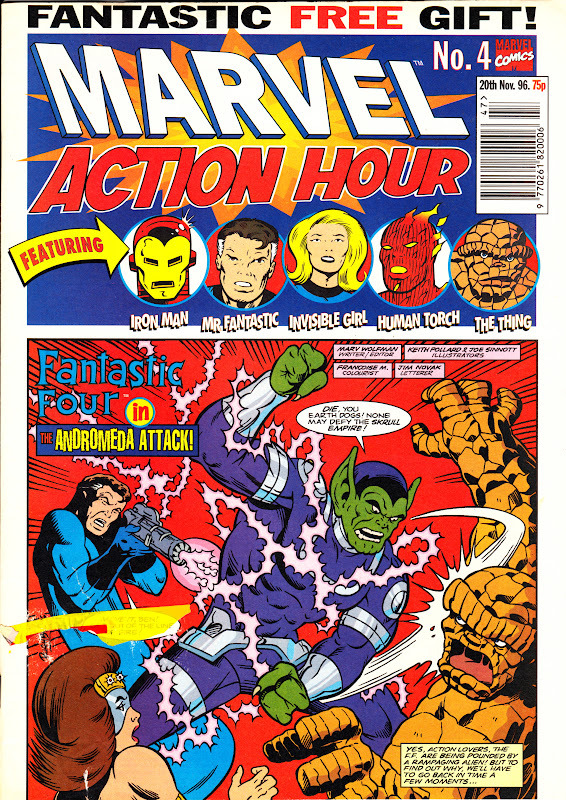 Presumably falling victim to poor sales (the BBC ran the TV show early on Saturday mornings) and the declining fortunes of Marvel UK, Action Four vanished suddenly after only four issues. For more Action Hour: see here. Timed to coincide with the 2005 feature film, this companion to ULTIMATE SPIDER-MAN and ULTIMATE X-MEN proved the least popular in the UK, ending after only 10 issues. 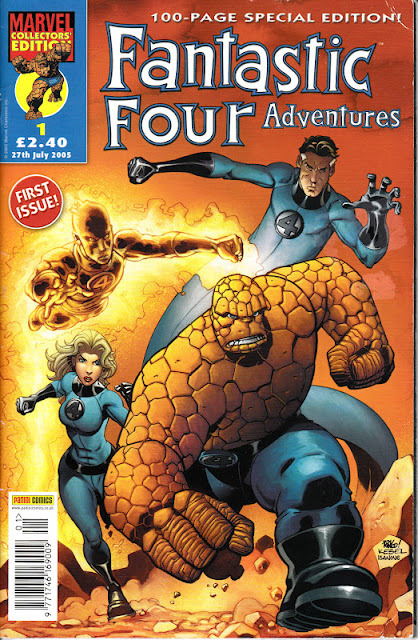 Panini must have high hopes for the FF movie, adding FANTASTIC FOUR ADVENTURES to their Collectors' Edition line alongside the A4 Ultimate FF. It proved the bigger hit, running until 2012 (clearing space for the launch of THE INCREDIBLE HULKS COLLECTORS' EDITION). As with the other titles in the CE format, it reprinted near-contemporary US material. It rebooted in 2010 with a new number one. Rumour suggests that "THE THING IS BIG BEN" was a copyright grab on the "Big Ben" name after a character of that name appeared in Dez Skinn's Warrior magazine. Brilliant stuff. The FF's second solo weekly featured a great free gift - a make-your-own Fanasticar too, which was... Fantastic! The WARRIOR connection does ring a bell. I think I read somewhere that it was cited in some of the correspondence between the two publishers during the legal dispute over the revival of Marvelman. I would have though that Marvel's claim on the ownership of the name "Big Ben" was so tenuous as to be non-existent so - maybe - they just did it to spite Skinn. I published a recent late-1980 interview with the post-Skinn management at M-UK and it's obvious that the parting of the ways hadn't been terribly amicable. I'm not familiar enough with Marvel's management structure to know if any of those senior people were still with the company - and holding a grudge against Skinn - by the time TTIBB surfaced. 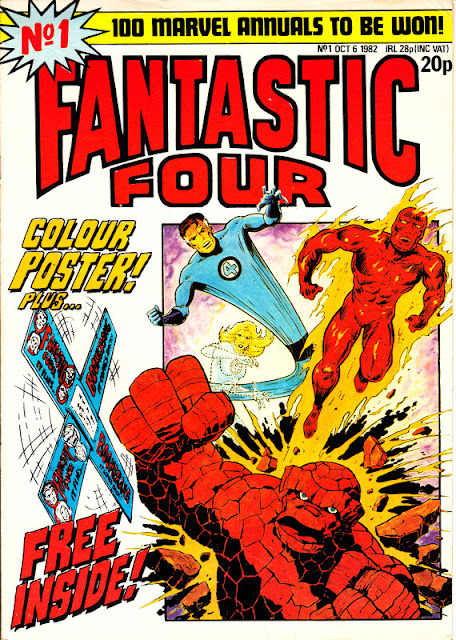 I think Marvel UK's decision to launch a new regular Fantastic Four weekly comic in September 1982 was largely influenced by the fact that BBC 1 were screening the "New Fantastic Four" cartoon series on television that Autumn. That was the one which had Herbie the robot in place of the Human Torch. Obviously they hoped anyone who became a fan of the cartoon would pick up the comic. This sort of thinking often influenced decisions at Marvel UK. For example, the Spider-man comic changed its name at least twice for such reasons: in Autumn 1981 it became the 'Super Spider-man TV Comic' when ITV began running the live action Nicholas Hammond TV series (a very belated UK TV run, as some of the episodes had been screened in cinemas first), and a bit later it became 'Spider-man And His Amazing Friends', adopting the same name as another cartoon series which BBC 1 began showing. If I recall correctly, the return of Spider-woman as a back-up strip circa 1983 also coincided with ITV screening a Spider-woman cartoon series.